BAMBOO GODS AND BIONIC BOYS: SEARCH FOR WENG WENG: Week #2 update! The film has been a labour of love since I started filming in 2006. In short (no pun intended, I swear), it's a guerrilla-shot chronicle of my obsessive quest to find the two-foot-nine James Bond of the Philippines. 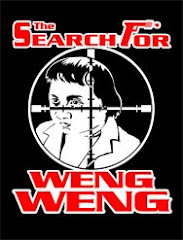 Funnily enough, THE SEARCH FOR WENG WENG is shaping into a film as much about obsession and following one's passions to extremes as it is about its two-foot-nine subject. With over 100 hours in the can, it's finally time to deliver a 90 minute documentary feature. The $30,000 we're asking for from Kickstarter pledges is to pay for its post-production and, down the track, touring the film internationally. The idea is to fund its completion in the same way it was filmed - guerrilla style - to retain as much control as possible over the project. The finished film will subsequently be released in this country theatrically and on DVD by Monster Pictures in Melbourne (http://monsterpictures.com.au/features/the-wild-wild-weng-weng/). At two weeks into the eight-week campaign, we are currently more than a third of the way towards our goal, and that's a very encouraging beginning. However, there's a long way to go, and for that reason I'm asking for a personal favour from each of you. - and overseas distributors, exhibitors, film festivals etc. I apologize for imposing on your valuable time, but I really believe you will recognize in this venture the tenacious spirit of independent filmmaking alive and kicking. Needless to say there is a lot riding on this for me, both professionally and personally, and I hope I can inspire you into coming along with me on my adventure of a lifetime. Thank you for your time and attention. I look forward to continuing this conversation here, by private message, or via email at andrewleavold@gmail.com. Is this a fake documentary about real artists or a real documentary about fake artists -- or a bit of both?